Planning • Experts say the founders intended the blocks to have multiple uses  including agricultural  all within the city. 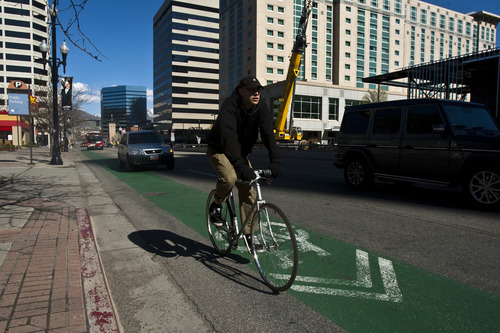 Photo by Chris Detrick | The Salt Lake Tribune A man rides his bike along 200 South Wednesday April 27, 2011. Salt Lake City proposing a 200 South bicycle greenway with new medians in the middle of the street with a bike and pedestrian path between the trees from 200 South to 1300 South, at the University of Utah. 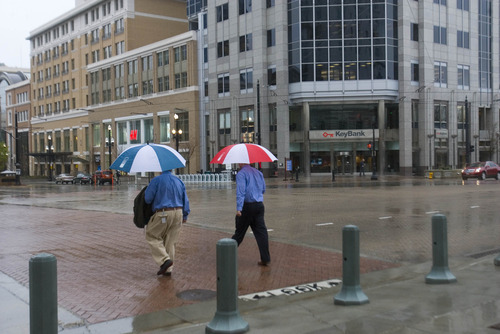 Paul Fraughton | Salt Lake Tribune Pedestrians make their way across South Temple in a spring rainstorm. Friday, April 5, 2013 Lennie Mahler | The Salt Lake Tribune Pedestrians cross State Street at 200 S through traffic backed up and clogging the intersection due to snow-covered roads, Thurdsay, Jan. 10, 2013. 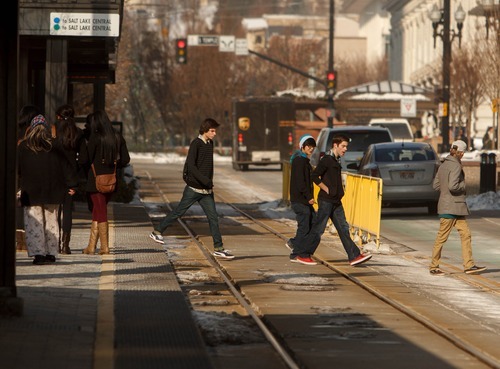 Trent Nelson | The Salt Lake Tribune Pedestrians crossing the TRAX lines outside of the crosswalk are easy to spot at the City Center station Thursday January 3, 2013 in Salt Lake City. Courtesy | Andres Duany A model of early Salt Lake City shows wide streets, only part of which were actually used for vehicle traffic. Urbanist Andres Duany, who was in Salt Lake City in May, has argued that streets in cities founded by Mormon pioneers originally had unpaved areas and more green space. 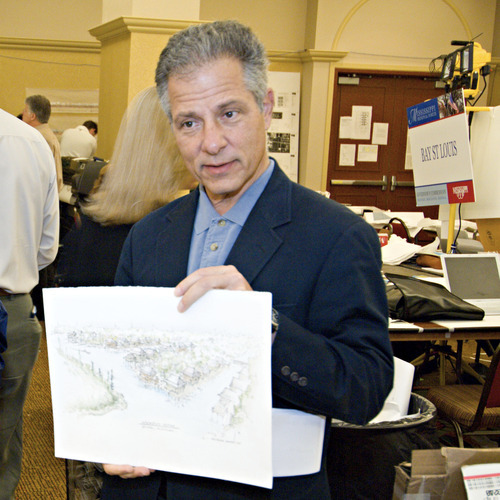 Andres Duany was among a group of city-oriented thinkers who visited Salt Lake City recently. Duany praised traditional Mormon pioneer city planning, but said that Utah's cities have not adhered to the city planning principles they were founded on. 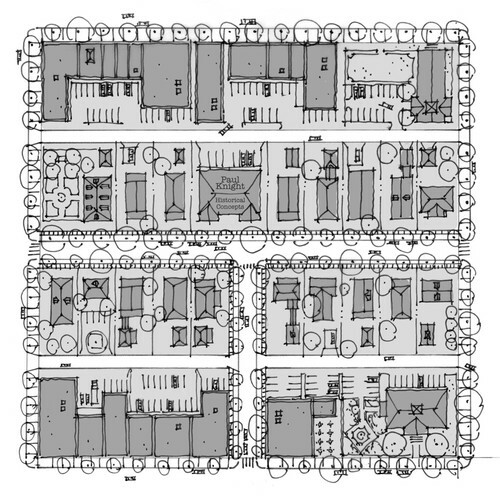 Courtesy image | Courtesy Architects, planners and other recently participated in a competition to redesign Salt Lake City's large blocks. The resulting designs were displayed during the Congress for the New Urbanism's gathering May 29-31 in Salt Lake City. | Courtesy Architects, planners and other recently participated in a competition to redesign Salt Lake City's large blocks. The resulting designs were displayed during the Congress for the New Urbanism's gathering May 29-31 in Salt Lake City. | Courtesy Architects, planners and other recently participated in a competition to redesign Salt Lake City's large blocks. The resulting designs were displayed during the Congress for the New Urbanism's gathering May 29-31 in Salt Lake City. | Courtesy Architects, planners and other recently participated in a competition to redesign Salt Lake City's large blocks. 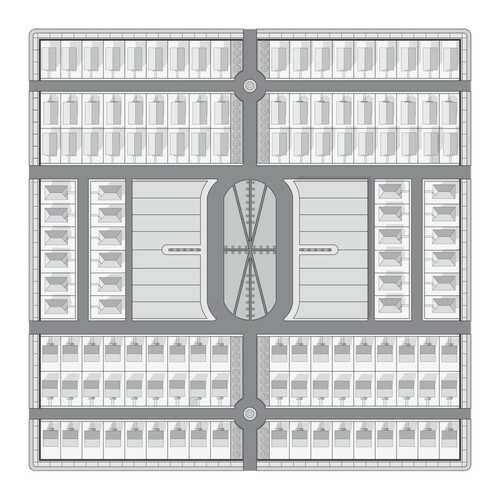 The resulting designs were displayed during the Congress for the New Urbanism's gathering May 29-31 in Salt Lake City. | Courtesy Architects, planners and other recently participated in a competition to redesign Salt Lake City's large blocks. The resulting designs were displayed during the Congress for the New Urbanism's gathering May 29-31 in Salt Lake City. | Courtesy Architects, planners and other recently participated in a competition to redesign Salt Lake City's large blocks. The resulting designs were displayed during the Congress for the New Urbanism's gathering May 29-31 in Salt Lake City. Salt Lake City has betrayed its founders&apos; vision. That was the message delivered by renowned urbanist, architect and writer Andres Duany during a recent visit to Utah&apos;s capital. The problem, he explained during an interview at the Grand America Hotel, is that Salt Lake City&apos;s massive streets were never supposed to be completely paved from edge to edge. Instead, they were supposed to respond to the buildings that line them, getting wider or narrower depending on the needs of the surrounding homes and businesses. 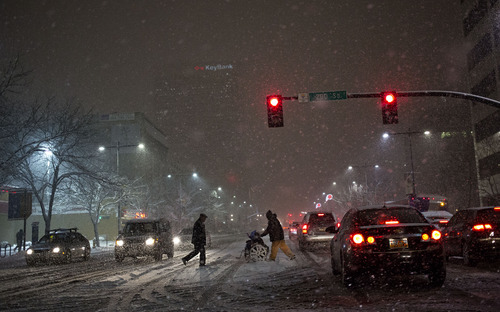 "Right now they&apos;re so wide and harsh," Duany said of Salt Lake City&apos;s streets. Duany was in town for the annual gathering of the Congress for the New Urbanism. Nearly 1,000 architects, planners and other urban thinkers showed up for the conference, which was held in Salt Lake City for the first time May 29-June 1. Duany contrasted Salt Lake City&apos;s current conditions to the city as laid out by Brigham Young, whom he called a master of management and the "Henry Ford of urbanism." When Salt Lake City and other Utah towns began, Young used a system called the "Plat of Zion" or the "Mormon Grid." 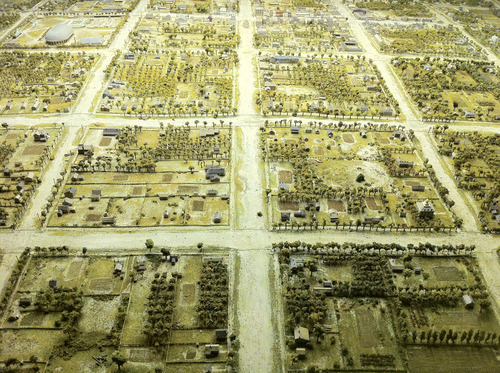 The system was developed in the mid-1800s by Mormon founder Joseph Smith as a way to logically organize cities. Ultimately, Duany said, Young and the early settlers managed to build more than 700 successful cities and towns in a period of 100 years  a feat not matched even by great empires in world history. And they did it while they were poor  a lesson Duany said is particularly relevant in a post-recession, post-housing-bubble world. Duany later said that, for many years, "Mormon towns" in Utah were considered beautiful places due to their unusual design. The streets, he explained, were paved just where the wheels of vehicles traveled  which wasn&apos;t necessarily in a straight line  and the rest of the "street" was left unpaved as green space. "Now you pave as much as you can as fast as you can," he added. "The present Salt Lake City is not what Joseph Smith and Brigham Young had in mind." 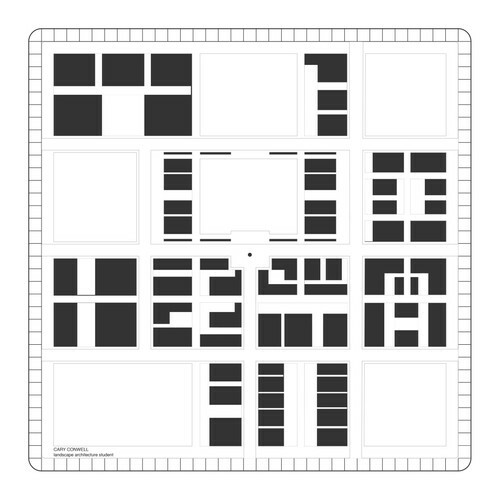 Typical Salt Lake City blocks are 660-by-660-foot squares. They include 10 acres. The original idea was that they could contain multiple uses  residential and agriculture for example  all within the city. But the blocks are far and away more massive than most other cities praised by urban thinkers such as Duany. 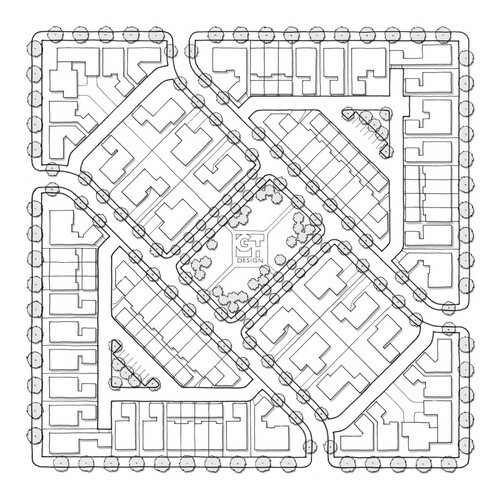 In an interview, architect and planner Paul Knight explained that big blocks produced by the Mormon grid don&apos;t lend themselves to a "fine-grained" city, or a place where there are lively streets filled with people and activity. "We don&apos;t build buildings that are 660 feet wide," he explained, pointing out that when the buildings are so much smaller than the blocks, there can be a lot of wasted space that kills vibrancy. 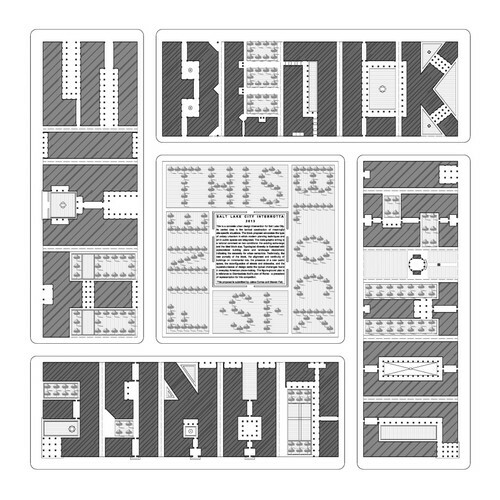 To prove his point, Knight created several hypothetical block designs. They were part of a competition he ran at the gathering, and inside the block he included massive structures such as the Empire State Building and Sagrada Familia, Gaudi&apos;s famous Catholic basilica in Barcelona, Spain. Knight said another problem is that surface parking lots sometimes proliferate on big blocks. Urbanist Steve Mouzon added that parking lots are particularly bad. "The worst thing you can do is put in a surface parking lot," Mouzon said. "People don&apos;t like to walk in a parking lot." Despite the challenges, Duany was optimistic about Salt Lake City. As he walked the halls of the Grand America, he spoke excitedly about how the blocks could be subdivided into smaller, more manageable units. The possibilities are endless and Salt Lake City, he said, could use its grid to apply the lessons from other cities. Mouzon also praised the potential of Salt Lake City&apos;s grid, suggesting during a session that one way to capitalize on the space would be to plant crops in the center of the blocks. "How do you go from a city experience to a country experience in 10 paces?" he asked. 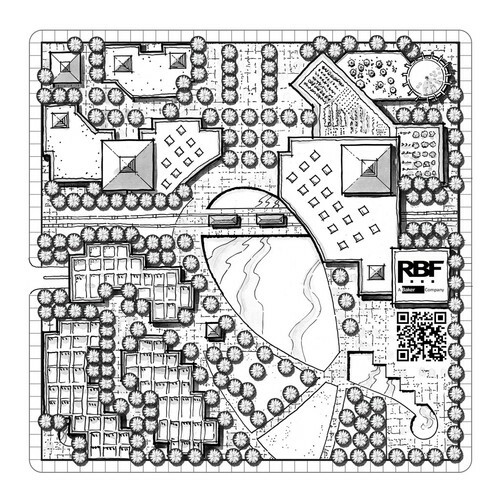 Mouzon answered his own question, proposing a ring of buildings around the blocks with agriculture in the center. The blocks could have as many as 12 pathways leading into them. But whatever happens, Duany said before the conference ended, Utah cities have a heritage and a history filled with good urban design. What they need now, he added, is a reminder of that heritage and hard work to restore it. "Cities will naturally get worse," he said, "unless you work on them." This isn&apos;t the first time Salt Lake City&apos;s physicality has been critiqued. In 2008, Pulitzer Prize-winning Chicago Tribune architecture critic Blair Kamin talked about the town and which buildings he liked.